Manufacturer of a wide range of products which include oil maker machine eps-01, oil extractor machine and oil press machine eps-tc602. This is extraordinary for the small machine which helps to improve the Health & Wealth of this human generation. This is a unique technology machine and can change the market scenario in a big way. Multifunctional Home Oil Press Machine for Pressing like Peanuts, Coconut, Sesame, Soybean, Walnuts, Sunflowers seeds, Vegetable seeds, Flax seeds, Almond, Castor Seeds, Mustard seeds and so on… Machine the waiting time appropriately during the cold sessions. ( Never turn it off in processing oil process ) Directly put dry ingredients. Press the “Squeezing ” switch and start pressing oil. After pressing ends, hold (don’t loosen) “Cleanup” switch for more than 20 seconds, and it will be easier to remove the motor that it can continue working for more than 4 to 5 hours. We suggest it works for 4 to 5 hours and take a rest for about 1 hour. That will be good for the machine. Oil extracting that depends on the oilseeds. Easy to operate, clean, move and store. First, shut off the power and power plug, then pressing chamber remains heat, wear cotton heat-protective gloves show as to prevent burns, or wait for more than 30 minutes so as to let the pressing chamber cools down completely. Take out the pressing rod and clean it with paper or cloth, rinse and clean the pressing chamber with water. Never clean with acid, alkali, soda and salt water, the more raw material moisture content is, the tighter the raw material slag sticks to screws, more difficult it is to wash,and you can cut it off with knife, in addition to pressing chamber, other parts are forbidden to enter water or other liquid, after cleaning promptly wipe or blow the water on pressing chamber with hair dryer before storing. An expeller press is a screw type machine, which presses oilseeds through a caged barrel-like cavity. This machine uses friction and continuous pressure from the screw drives to move and compress the seed material. The oil seeps through small openings that do not allow seed fiber solids to pass through. Afterward, the pressed seeds are formed into a hardened cake, which is removed from the machine. The pressure involved in expeller pressing creates heat in the range of 140-210o F (60-99o C). This is an extra ordinary small machine which helps to improve the Health & Wealth of this human generation. This is a unique advanced technology machine and can change market scenario in a big way. Multi functional Home Oil Press Machine for Pressing like Peanuts, Coconut, Sesame, Soybean, Walnuts, Sunflowers seeds, Vegetable seeds, Flax seeds, Almond, Castor Seeds, Mustard seeds and so on Machine Motor is industry motor that it can continue 24 hour working and long life Oil extracting that is depends on the oil seeds. Easy to operate, clean, move and store. 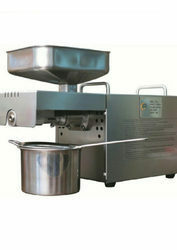 - This small oil press is less expensive and much easier to operate than bigger oil press machines. - There is no any chemical mix during the process so you get pure oil. - Light in Weight and less noise. - It is very convenient that can help you make oil any time at any place. - With this home use oil press, you can make different type of oil as you want to press. 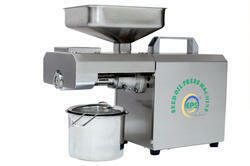 - This home oil press can press 4 to 7 kg of seeds per hour. - This home use oil press can work up to 24 hours with non-stop. - Small land occupancy. So this machine won't take you much kitchen space and can be easily moved. Turn on the heating switch and wait for more than 10 minutes and extend the waiting time appropriately during the cold sessions (Never turn it off in processing oil process ). Press the “Squeezing " switch and start pressing oil. After pressing ends, hold (don't loosen) "Cleanup" switch for more than 20 seconds, and it will be easier to remove the screw and then clean, If you don't press the cleanup switch, when pressing chamber becomes cold, the interior residual slag harden and pressing rod will be blocked in the pressing chamber and cannot be taken out for cleaning. In case of power out it during the process, please turn off the start switch, and unplug power plug at the same time, continue to press after turning on the heating switch for more than 10 minutes when power is connected. Clean: remove the pressing chamber and clean it with edible detergent and water. Pull out the power plug and store the machine in a dry place. The pressed oil will automatically separate after storing for a night under room temperature 15 degrees above and does not need to filter. In the process, sometimes material from an aerial state in the feeding port because raw materials are damp, or the surface is not smooth, you can gently touch the raw materials. Notice: Never put the finger or hard objects such as metal bar into the entrance to the chamber to stir raw materials. This small oil press is less expensive and much easier to operate than bigger oil press machines. There is no any chemical mix during the process so you get pure oil. Light in Weight and less noise. It is very convenient that can help you make oil any time at any place. With this home use oil press, you can make the different type of oil as you want to press. This home oil press can press 3 to 6 kg of seeds per hour. This home use oil press can work up to 4 to 5 hours with non-stop. Small land occupancy. So this machine won’t take you much kitchen space and can be easily moved. Cooking oil is the plant, animal, or synthetic fat used in frying, baking, and other types of cooking. It is also used in food preparation and flavorings not involving heat, such as salad dressings and bread dips, and in this sense might be more accurately termed edible oil. Cooking oil is typically a liquid at room temperature, although some oils that contain saturated fat, such as coconut oil, palm oil, and palm kernel oil are solid. There is a wide variety of cooking oils from plant sources such as peanut oil, sesame oil, Coconut oil, soybean oil, mustard oil, flaxseed oil, olive oil, sunflower oil, palm oil, and other vegetable oils, as well as animal-based oils like butter and lard.